We are sure our many regular guests will agree that this gem of a Chalet Hotel is a superb addition to our range in Lech. It has a lovely ambience from the moment you enter and our team can’t wait to welcome you through its doors. Lech is a picture perfect ski resort with a bustling cosmopolitan village centre and the Montfort is ideally located for both ski access and the full village experience. It is discreetly set back from the main road but within a couple of minutes easy stroll of the chic boutiques, stylish shops and lively après ski bars. This Chalet Hotel has been lovingly cared for by its owners, with a modern approach and understanding for traditional Austrian furnishings, colour and style. This harmonious blend of old and new creates an atmospheric and comfortable feel to the rooms and communal areas. The lounge/bar is beautifully decorated with a typically Austrian central feature, a traditional Kachelofen (tiled stove) with its stucco exterior and bench seating – an ideal spot for afternoon tea, canapés and pre or post dinner drinks. The dining room leads off from the lounge/bar and is light and airy with tasteful wood cladding and attractive furnishings. 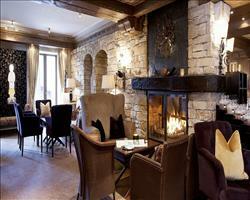 The room lends itself to convivial dining and the enjoyment of our ‘Culinary Choice’ evening meals. For a Chalet Hotel of this size, the Wellness Spa is a real treat, offering guests numerous ways to relax. Time can be spent in the sauna, steam room or in a warm and soothing spa-bath, or why not all three?! All the bedrooms are tasteful and well-appointed with en suite facilities, plus each have a TV and safe and many also have either a south-facing balcony or terrace with super mountain and resort views. The Chalet Hotel Montfort couldn’t be in a better position for the nursery slopes of Lech, being just metres from the Flühen and Schwarzwand drag-lifts. It is here that the children’s ski school runs its classes, as well as being the location for some of the adult lessons. For more experienced skiers ready to enjoy the vast ski area of the Arlberg, the main lifts are only approx. 4-5 minutes easy walk from the front door. The Rüfikopf Gondola in the village centre offers the chance to window-shop as you pass the many classy shops en route. From the top you can access the Stubenbach slopes, where the lovely open blue and red runs lend themselves to cruising with style, and then on down into the charming village of Zürs. Going the other way from the central hub and over the river, the Schlegelkopf chair-lifts are again just four minutes from the Montfort, from where the tree-lined slopes and delightful lunch spots of Oberlech are easily reached. And for skiers and boarders who like to explore, going higher and further opens up some challenging off-piste itineraries from the far point above Zug, at the Zuger Hochlicht. At the end of the ski day you can return to the village centre from any of your chosen routes and just stroll the four minutes home, stopping of course for some après ski, Lech-style, on the way. Supplements per person per night: bath/wc £3; bath/wc & terrace £ 4; Rooms 8, 9, 10 with bath/wc/balcony £6; Room 11 if only 2 sharing: £5. No single room supplement for Room 6. We update Chalet Hotel Montfort's details often, but facilities do change. e.g. some extras listed by the supplier as "free" or included might only be for the first time you use them, or for one time per party, then charged for further use. If any specific feature is essential to your holiday, make sure you ask us to confirm the details of it before you book your holiday. This package holiday to Chalet Hotel Montfort in Lech, Austria departs Saturday 21st December 2019, for a 7 night stay on a "catered chalet" board basis. A local tourist tax (Taxe de Sejour or Kurtaxe) is levied by many councils in European ski resorts. It varies by standard and type of accommodation and is age dependent, so not everyone is charged. It's not included in the basic price of your holiday and is usually paid locally. For reference, the average charged in winter 15/16 was between 50p and £2 per person, per night. One of the classics, Lech is somewhere you should definitely ski at least once – and we won’t be surprised if, like us, you want to come back. Acclaimed for its village charm and world-class ski area, this is a favourite of the rich, royal and pro’ where you’ll experience the Austrian Alps at their snowiest and most glamorous. Lech lift pass price last reported as €235,00. Ask for a quote when booking Chalet Hotel Montfort. Lech has NSEW facing slopes. Usually open for skiing December- April. Hotel Lech/Reside... Lech Austria, Stansted to Innsbruck 21st December. 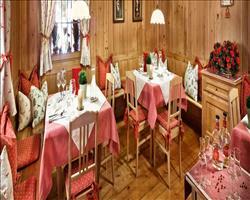 Hotel Berghof Lech Austria, Stansted to Innsbruck 21st December. I don’t think any of us had any complaints about our week here! There were nice views from several of the bedrooms. By chance my husband and I had the nicest room, it was spacious enough that we could all gather for a drink in the evenings. The rest of the chalet hotel, dining and living areas etc. were all fine. The food was good; you always had a choice of meals although sometimes the presentation didn’t reflect what you thought you’d ordered… there were always clean plates at the end of the mealtime though! To get to the skiing, some people plodded up the hill with their ski boots on whereas we hired skis and were given locker space in the hire shop which was near the first lift. This worked out well as I wouldn’t have fancied trudging up in ski boots. "Nice hotel in a good position"
We liked the hotel and thought it was pretty good. It was well located and the staff were very friendly. Food was generally very good, not traditional Austrian but “Chalet haute cuisine”. Our bedroom was fine, with a traditional feel. We liked the bar, reception and social areas which were more traditional than smart. One thing they need to fix is the steps from the ski room up to the outside. There’s a flight of concrete steps that are crumbing away and it’s not really safe to go up and down in ski boots, at least one in our party tripped while we were there. I would say the chalet was average, but the staff very friendly. The facilities were basic and the food average/poor. We loved the fact they were relaxed, and we were lucky most the other guests had children who all played together. It is convenient for the ski school too. "We had a fantastic time!" The staff were excellent and the rooms we had were terrific. The food was very nice indeed, we always had a choice and they asked us what we wanted for supper in the mornings, the whole system worked really well. Breakfast was super too. The location was brilliant for youngsters as it’s right next to the nursery runs – my daughter in law was very happy. We were there with some other families and it was just like staying in a friend’s home, it was so sociable and lovely to have the children running around together. "A Superb week in Lech"
Superb week! The chalet hotel was fine, adequate for what I wanted and what I paid for. I wouldn’t have wanted to pay more for it, but got a good discount. The best part of the week was the food. Location was brilliant, a bit of a walk but generally OK. The company was fine. "Sno brainer, base of slopes in world class resort"
If you've heard of the twelve 'must ski' resorts or the 'Best of the Alps' list, that may be why you're looking to book a visit to Lech. It's one of the classics and this traditionally built yet modern and stylishly outfitted hotel is set at the base of the nursery slopes, which is ideal for all those first time skiers and families taking children to learn to ski. The location is superb, set quietly off the main road and still within a short walking distance of the village centre. The facilities and service provided is top notch, making the whole experience one you will not forget.